Our readers say it all. Heavy and violent thunderstorms reported from Western Mah. and from the Ghat regions during the weekend. As soon as Vagaries gets any feedback, its put it up to update the readers of the newest and first hand developments. Nt mentions a paper clipping stating thunderstorm in Bhuj, Kutch. Bhuj received 18 mms yesterday, and 40 mms today, taking the Oct/Nov total to 130 mms.Chennai is 258 mms in the same period ! And I try to reason out this un-seasonal weather behaviour, to the best of my knowledge. But it boils down to one thing for sure, as emkay puts it, absence of W.D.s. In the blog on " Where is the North India Winter" on 9th. Nov, I mentioned this lack of W.D.s as the main reason for all this topsy turvy. 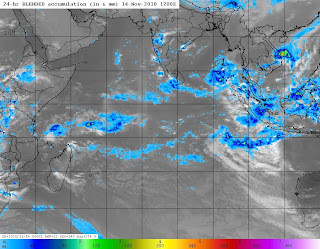 As I said, systems from the bay have a "field day" due to non resistance, and merrily move NW into Central India or re emerge in the Arabian Sea and move North. The remnant UAC lingering over the region of North Mah. is expected to hang on today, but shift its activity to the central regions of India,with a weakening effect somewhere near west M.P. and east Rajasthan by Tuesday. Latest Upper Troposphere Humidity also shows a reduction over the Mah. 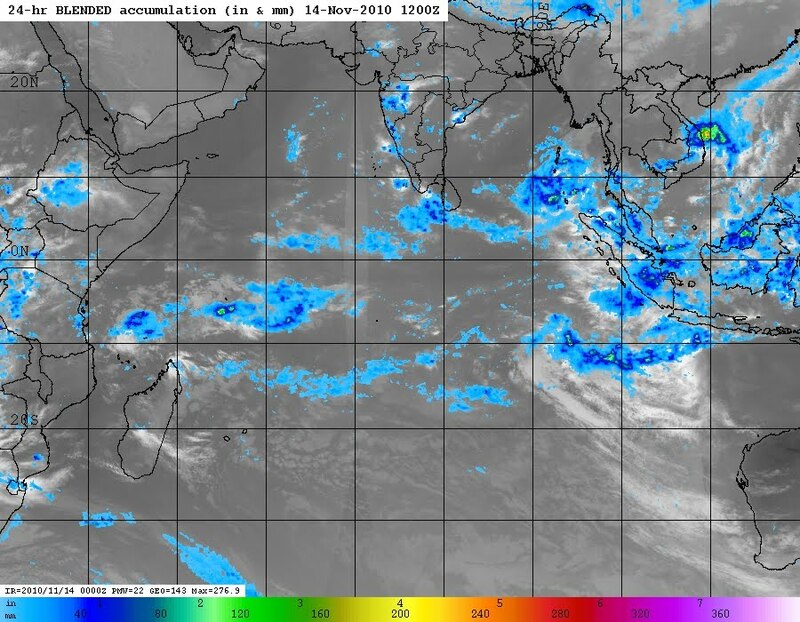 region.Thus clearing the way for sane weather conditions for Gujarat and Mah. from Tuesday onwards. But not for long !! The well marked low, now in the Bay, ie expected to be in a bit of a hurry to hit land. So before it can form into a cyclone, I feel it should strike T.N. by 17th, maximum as a DD, and travel inland. Where ?? You've guessed it ! 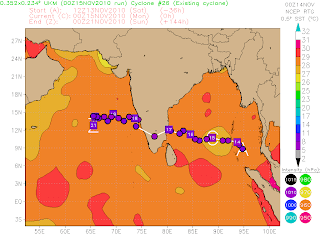 It will travel the path of the existing weak trough, dropping into the Southern Peninsula, and move into South Karnataka thru interior T.N, and thru Kerala/Karnataka back into the Arabian Sea. By the 19th, it should re emerge. Again, no W.D.so,make hay ! And that's when the action can start again, for Mah. If there is no holding back, (read no W.D.) it can move North along the west coast. (Though forecast models deny such a course today). 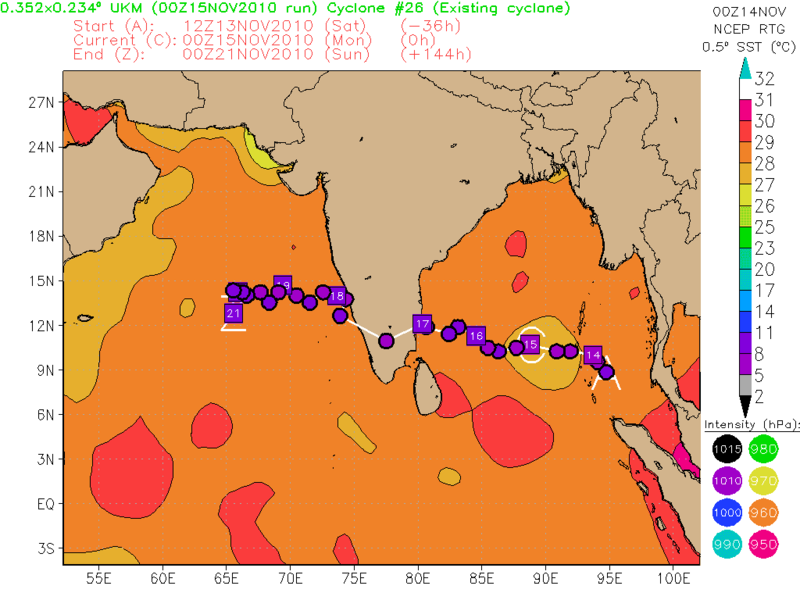 In that case, precipitation will start from Goa/S.Konkan/South Mah. on 18th. 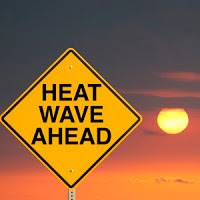 itself, and Goa could be "in its way" again, so more rains there. Western Mah. can receive precipitation from 19th./20th. And in that case, Mumbai,rain coming for the weekend. Detailed 4 days Mumbai Forecast by evening.